The Titleist AP2 714 forged irons delivers tour proven performance, looks and feel. These forged irons feature an advanced dual cavity design with innovative tungsten weighting coupled with a tour proven profile with progressive weighting, face thickness and sole widths. The improved technology delivers superior distance control, solid feel with exceptional playability and forgiveness in a forged iron. The AP2 714 Forged irons have a compact and square profile with a forged carbon steel head. The low CG designed long irons generate an optimal high launch trajectory and the thicker faced, flatter launching short irons provide improved workability and better distance control. Tour-Proven, deep, undercut, compact dual cavity design with innovative tungsten weighting produces increased playability. Superior and improved compact playing profile with a satin polish finish with progressive weighting, face thickness and sole widths. Review by Jeff, 2 years ago. Is it possible to see pictures of the actual clubs being sold? Thank you for your interest in our store items! Unfortunately we do not have pictures of our items due to the volume of our inventory. Our listing agents take special care in describing our items for this reason. We apologize that we are unable to meet your request. The photo in the ad is a representative stock photo. It is intended only to show the model of the club. The loft, flex, dexterity, etc. will vary. 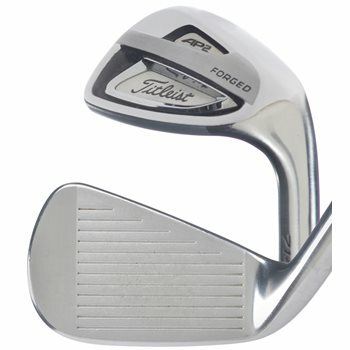 Do you also have an AP2 714 3 iron with an XP 95 stiff shaft? Can you make each club 3° flat? Unfortunately we do not have the ability to do any club repair at our facility at this time. Any modifications necessary will have to be done locally. can you change length and lie on any order? Unfortunately, we do not perform length and lie adjustment services, only re-gripping. We apologize for the inconvenience.